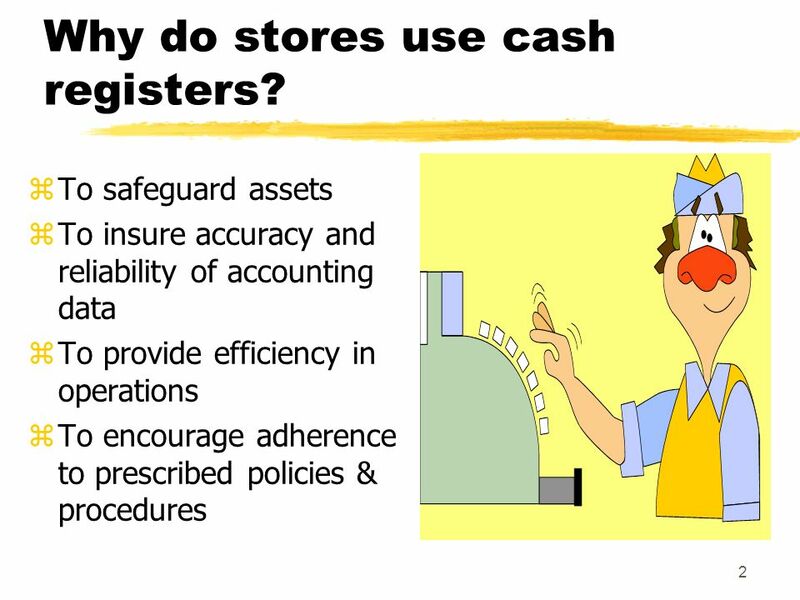 Internal Control Basic Concepts 2 Why do stores use cash registers? zTo safeguard assets zTo insure accuracy and reliability of accounting data zTo provide. 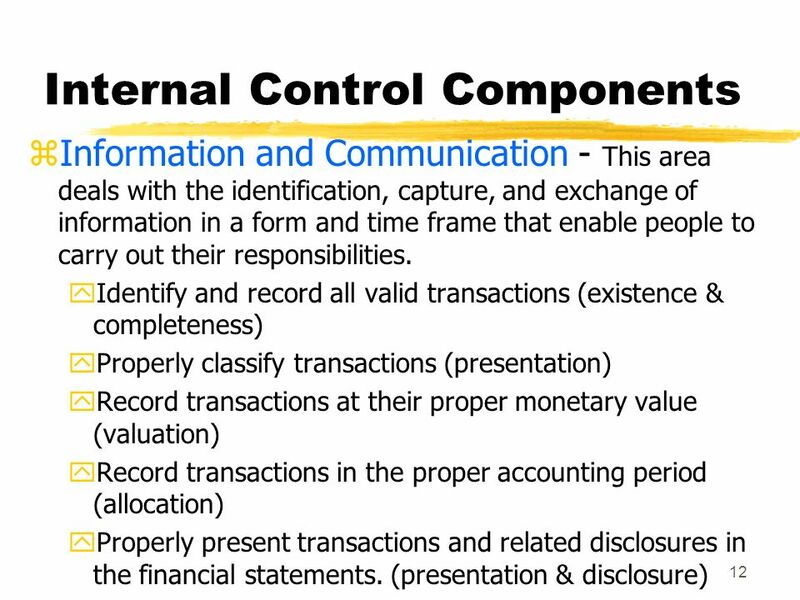 4 3 Why Consider Internal Controls? 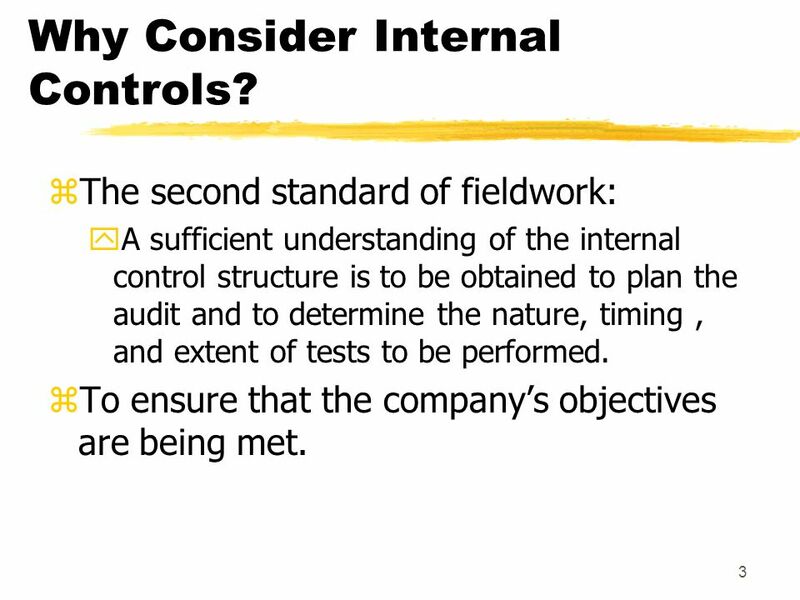 zThe second standard of fieldwork: yA sufficient understanding of the internal control structure is to be obtained to plan the audit and to determine the nature, timing, and extent of tests to be performed. 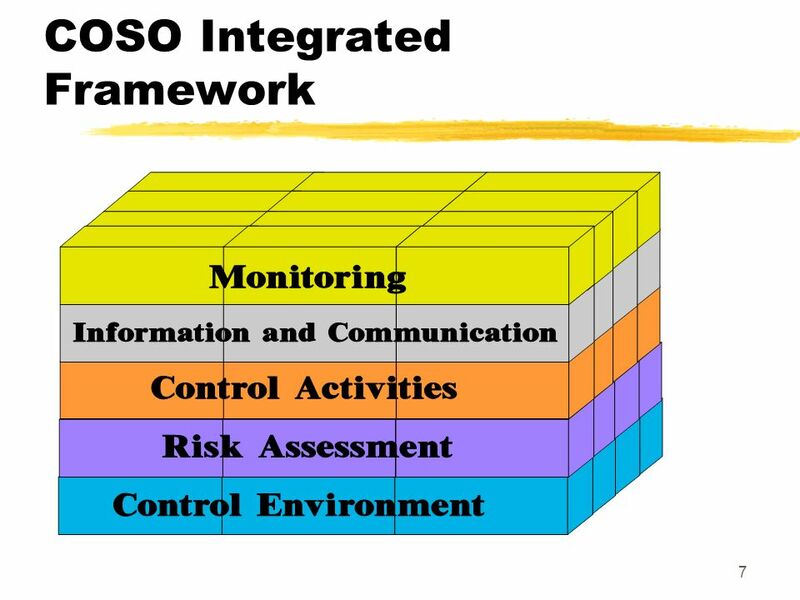 zTo ensure that the companys objectives are being met. 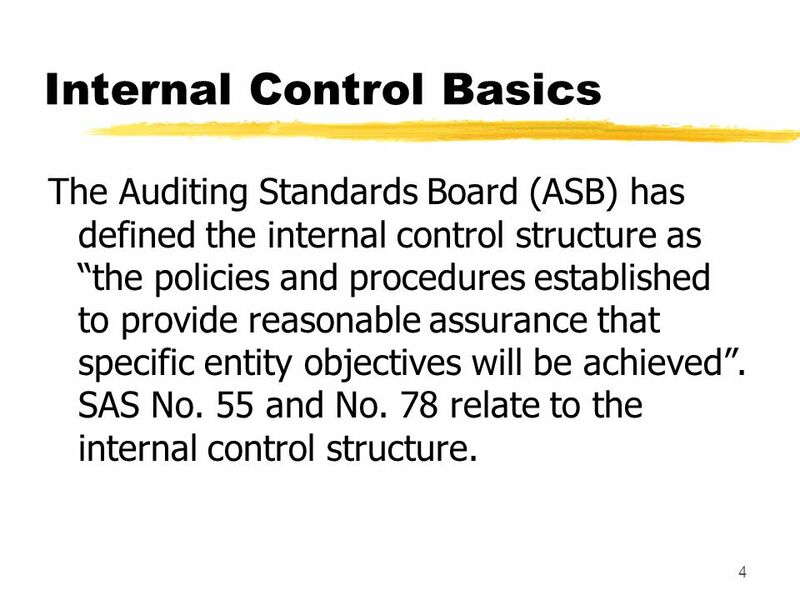 5 4 Internal Control Basics The Auditing Standards Board (ASB) has defined the internal control structure as the policies and procedures established to provide reasonable assurance that specific entity objectives will be achieved. SAS No. 55 and No. 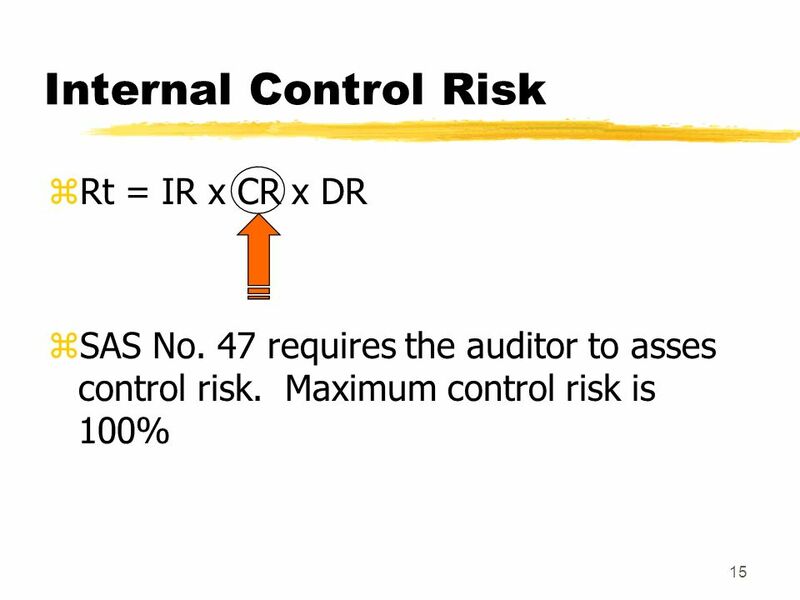 78 relate to the internal control structure. 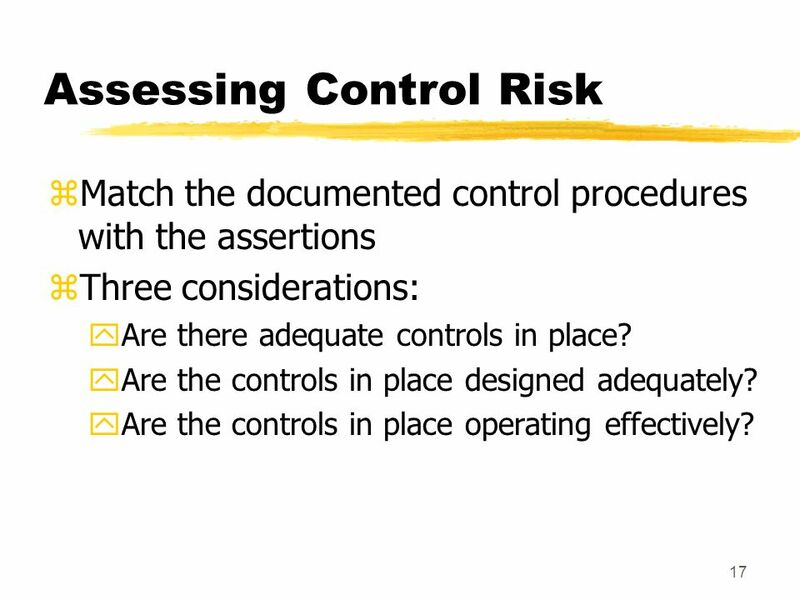 18 17 Assessing Control Risk zMatch the documented control procedures with the assertions zThree considerations: yAre there adequate controls in place? 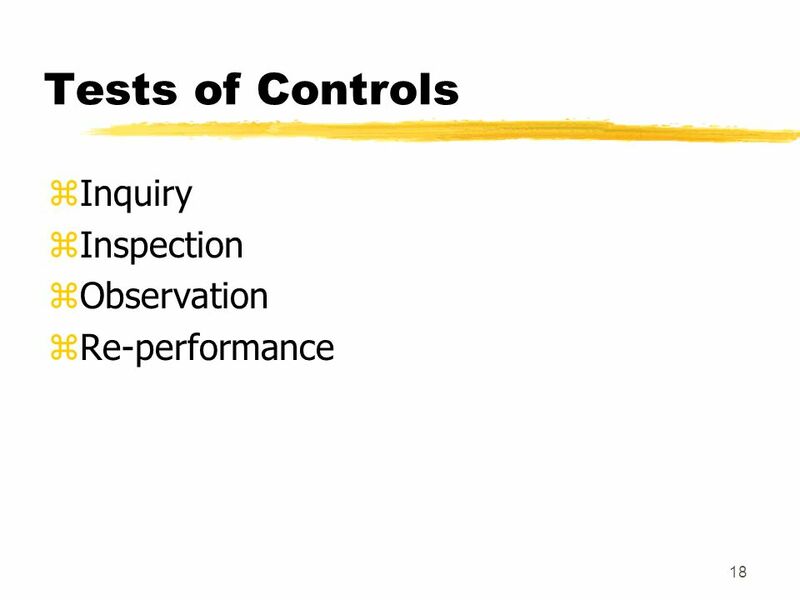 yAre the controls in place designed adequately? 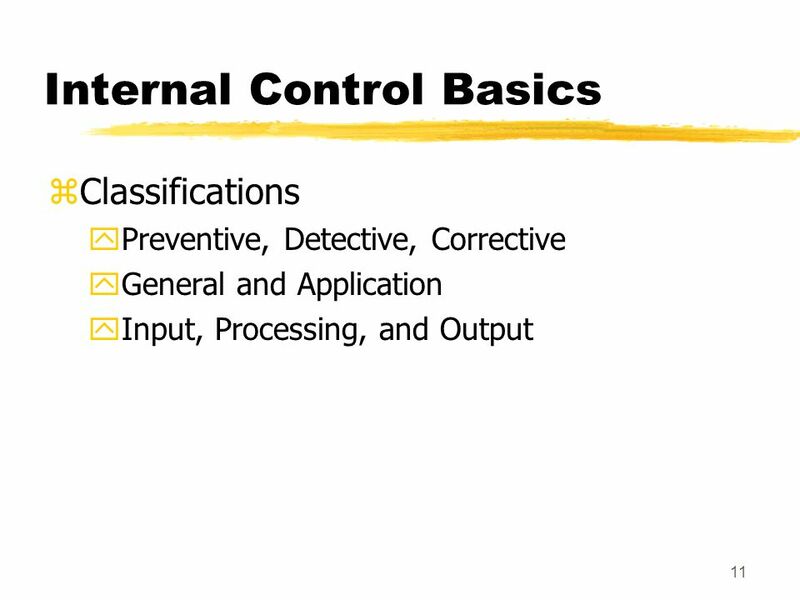 yAre the controls in place operating effectively? 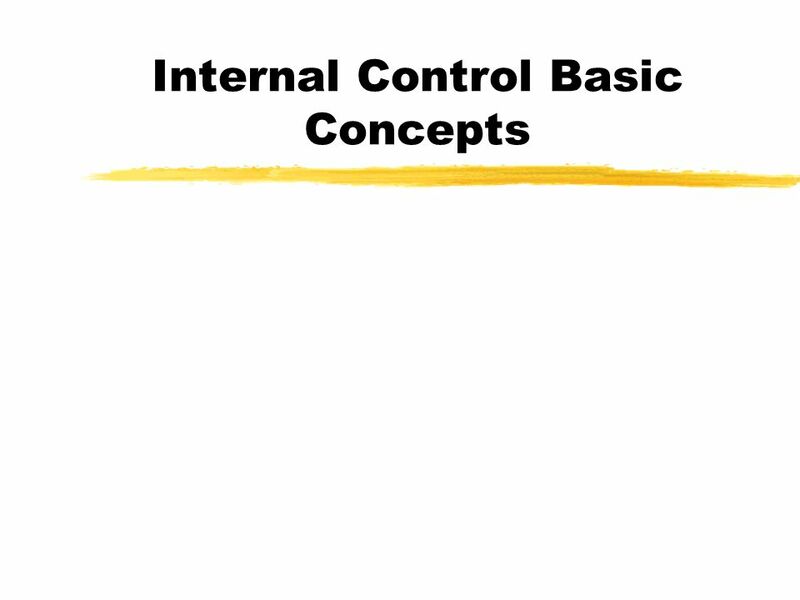 Download ppt "Internal Control Basic Concepts 2 Why do stores use cash registers? 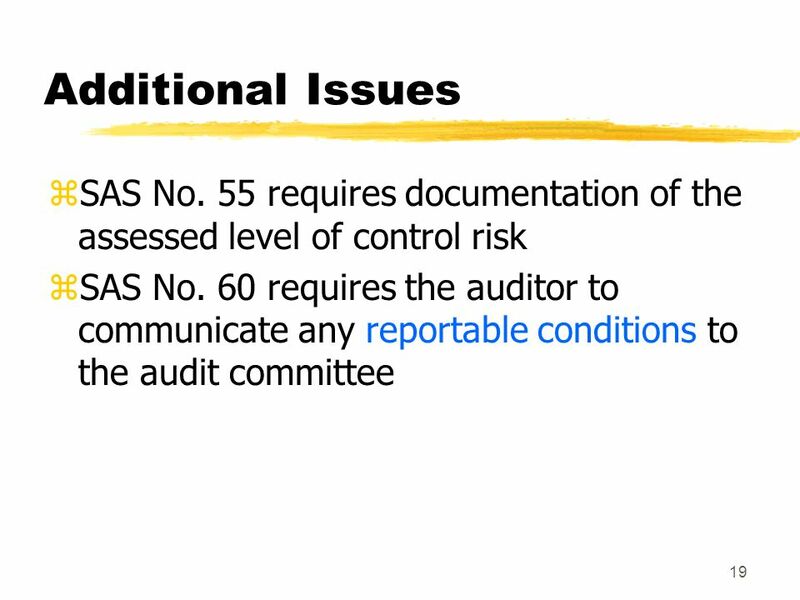 zTo safeguard assets zTo insure accuracy and reliability of accounting data zTo provide." 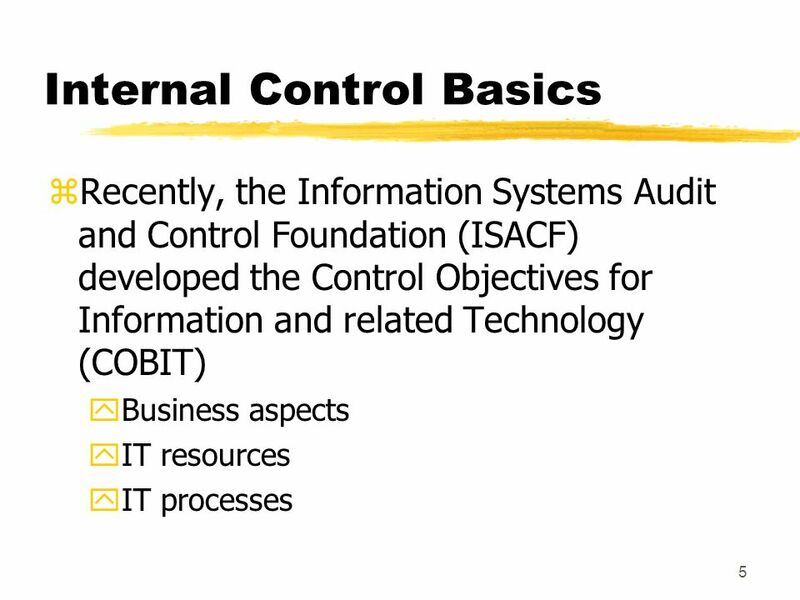 Chapter 7 Control and AIS Copyright © 2012 Pearson Education, Inc. publishing as Prentice Hall 7-1. 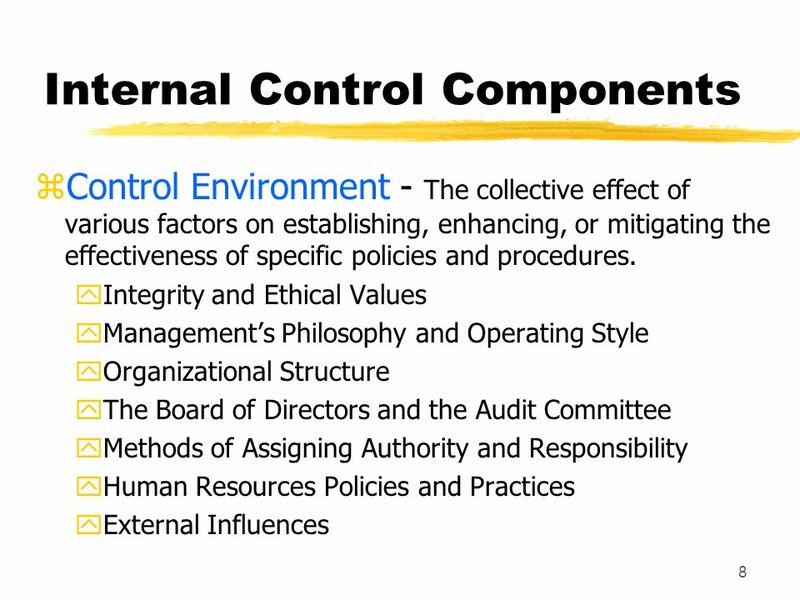 INTERNAL CONTROL. 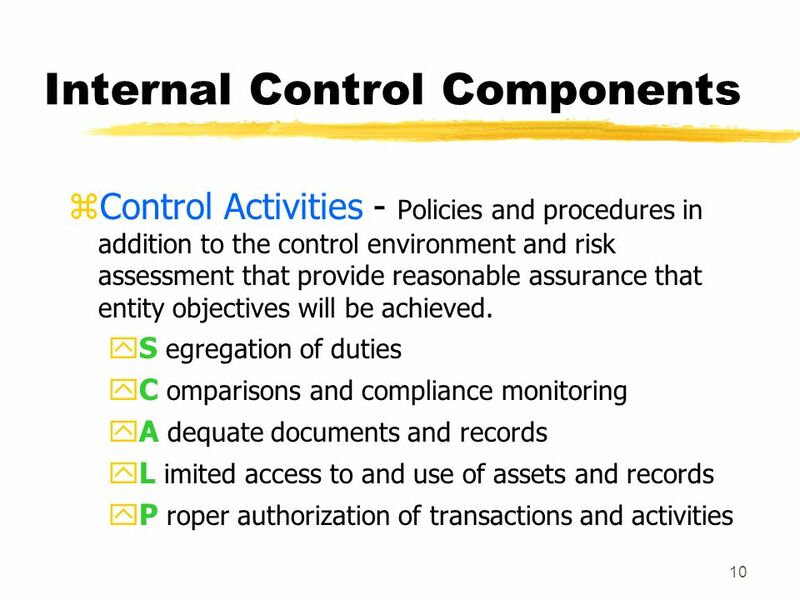 INTERNAL CONTROL DEFINED  INTERNAL CONTROL IS A PROCESS - EFFECTED BY AN ENTITY'S BOARD OF DIRECTORS, MANAGEMENT, AND OTHER PERSONNEL. Standar Pekerjaan Lapangan: Pemahaman Memadai atas Pengendalian Intern Pertemuan 5. 6-1 McGraw-Hill/Irwin ©2002 by The McGraw-Hill Companies, Inc. All rights reserved. 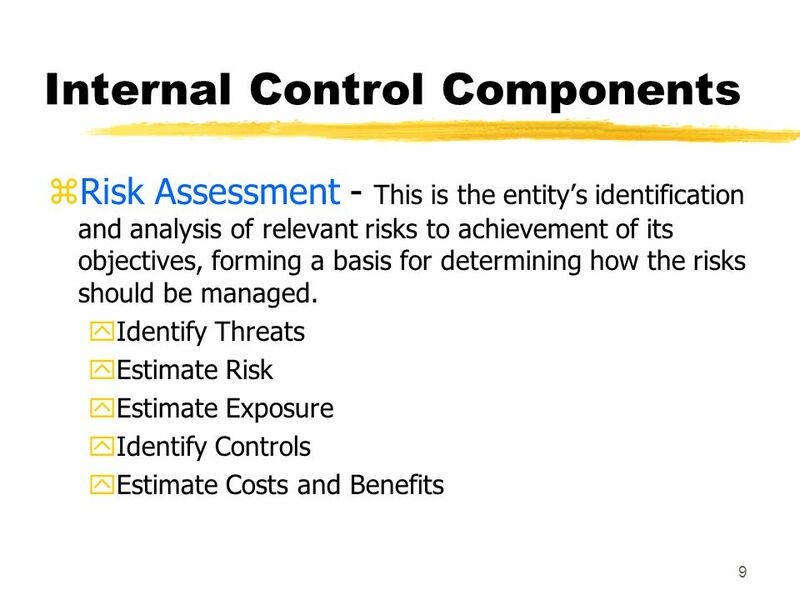 Chapter 6 Internal Control Evaluation: Assessing Control Risk. 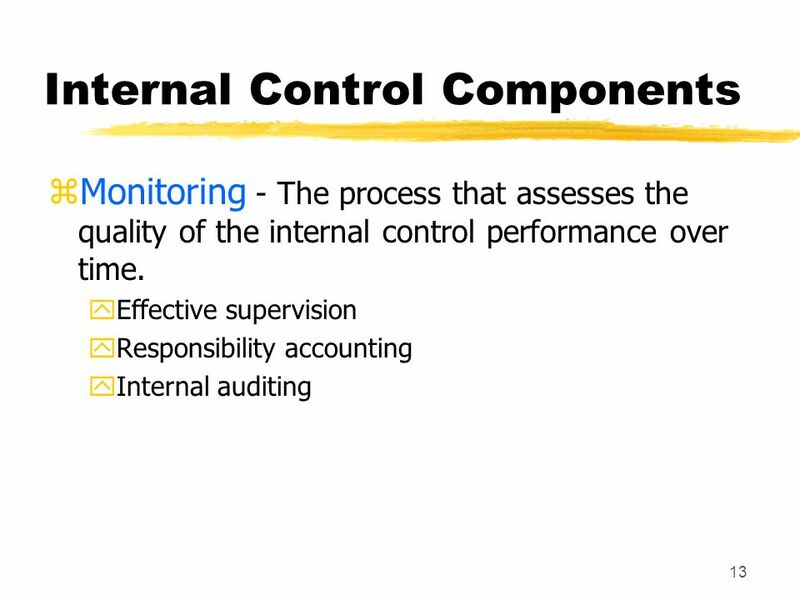 Internal Control. 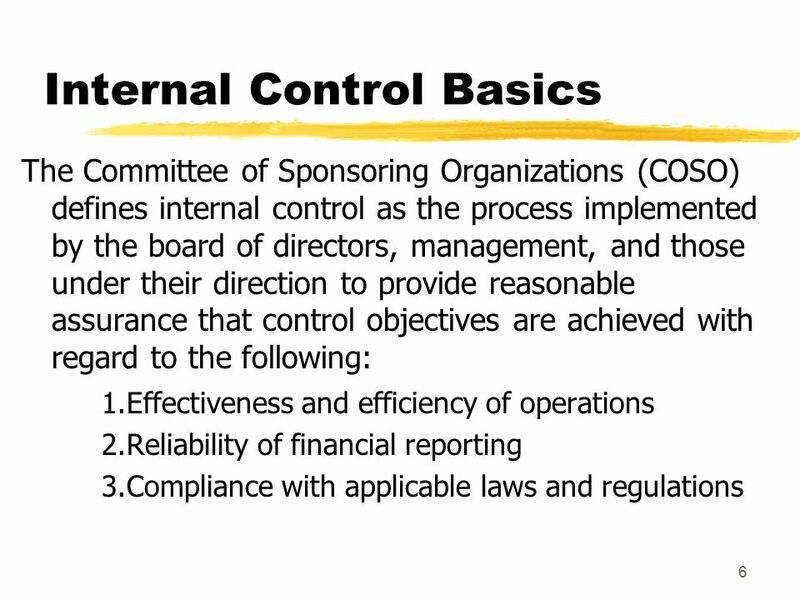 COSO’s Framework Committee of Sponsoring Organizations 1992 issued a white paper on internal control Since this time, this framework. 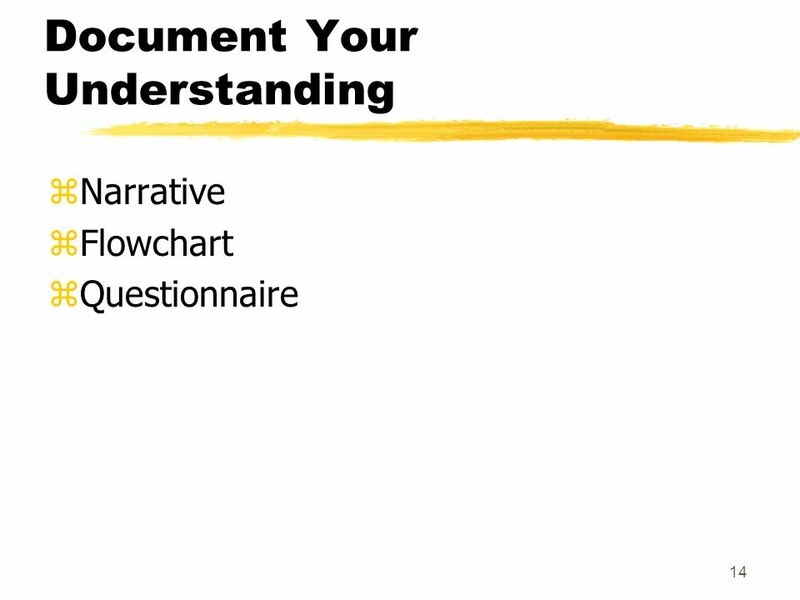 5-1 McGraw-Hill/Irwin ©2005 by the McGraw-Hill Companies, Inc. All rights reserved. 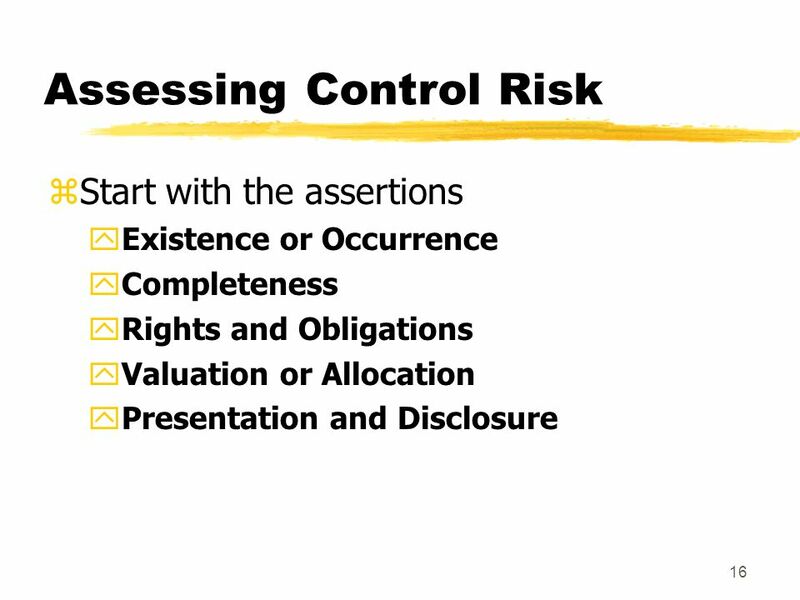 Chapter 5 Internal Control Evaluation: Assessing Control Risk “If everything.